Rare 3303 Water Street Penthouse At The Corner of "OH" and "MY"
In a building where corner properties are rarely available, Unit 8F is an amazing two-story true penthouse. Designed by award-winning architect, Richard Williams, the newly renovated 4,000 square foot space comes with an additional 3,200 square foot private roof terrace. 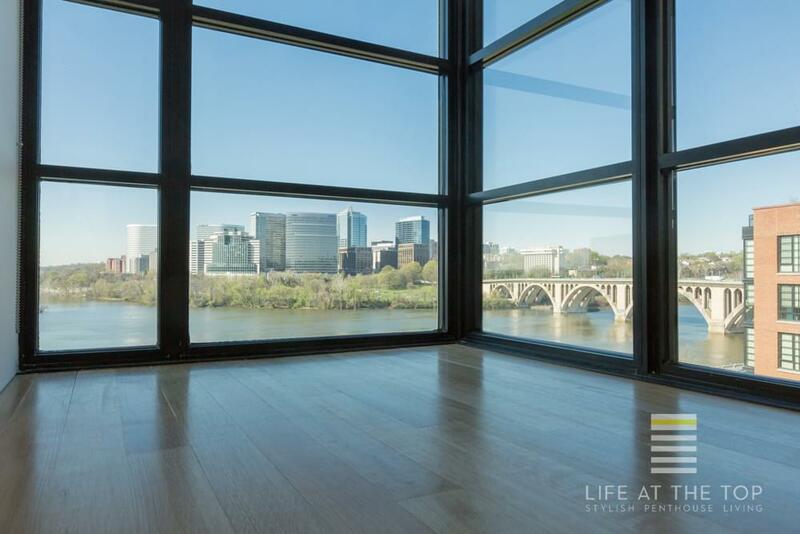 Inside and out, 360-degree breathtaking views of the Potomac River, Key Bridge, Arlington Skyline and the Georgetown Canal await the fortunate buyer. Enclosed by glass on three sides, the living room offers the most expansive river views. “We opened up the interior and organized it so the spaces could flow and slide into one another,” said Richard Williams. The architect worked with Glass Construction to take advantage of the floor-to-ceiling glass framing three sides of the unit by opening sightlines to the views from each room. Three bedrooms, three and one half baths and dramatic interior appointments abound at every turn. The European custom-designed, open-plan kitchen includes professional grade stainless steel appliances, maple cabinetry and marble countertops. Baths feature deep-soaking tubs by Waterworks, marble floors, countertops and bath/shower surrounds, and frameless-glass shower doors. Built-ins and walls of closets provide storage that keeps clutter at bay. 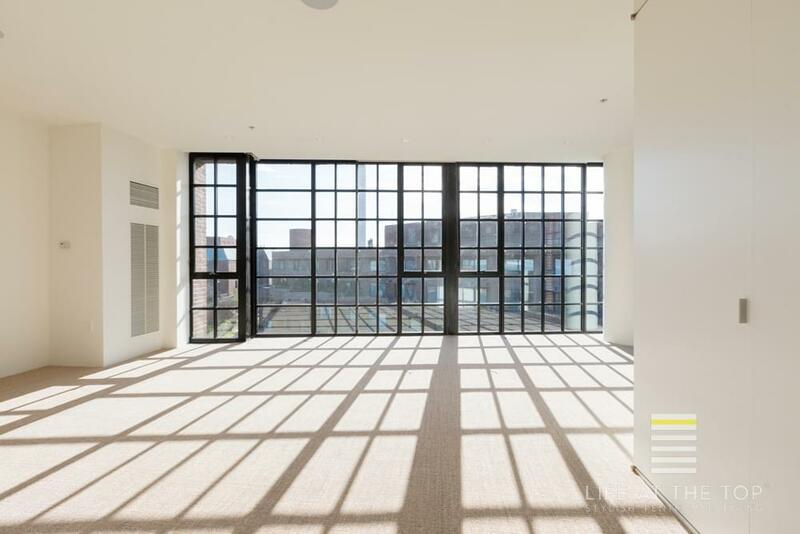 Located on a prominent site between the Potomac River and the C&O Canal, 3303 Water Street was conceived by its developers, EastBanc, and Handel Architects LLC to reflect the area's industrial past. The building employs brick, black metal, and precast concrete to evoke the material elements of an industrial building and respond to its historic context, but the project also integrates substantial amounts of exterior glass to provide views and light. Among its many design awards, 3303 Water Street includes the Housing Design Award from the American Institute of Architects (AIA) New York chapter, and the Residential Design Award from AIA/DC. Residents and visitors are welcomed via a porte cochere entrance on Water Street as well as a convenient, pedestrian-only, secondary entrance at the top of the hill on 33rd Street just below M Street. Once inside, elegance flows and flows. The full-service building has a doorman, concierge, rooftop pool, sundeck and garden terrace with adjacent locker rooms, fitness equipment and common room. The unit includes three indoor garage spaces and three private storage rooms. Located in North West Washington, DC along the Potomac River waterfront, Georgetown is unquestionably one of the most affluent neighborhoods in Washington and home to many of the city's politicians and lobbyists. 3303 Water Street has a location with a 95 Walk Score. Everything you could need, want or crave is a few minutes' casual stroll away. Georgetown Cupcake on M Street is 5 minutes from your door and a block away from Pie Sisters. All along M Street and Wisconsin Avenue high-end shops, bars, and restaurants abound. A 3-minute walk to the Georgetown Harbour takes you to a variety of fine restaurants including the fabled Fiola Mare — praised and prized throughout the Capital Region and beyond. Other nearby dining favorites include 1789, Citronelle, Cafe Milano, Bistro Francais, Bourbon Steak, Martin’s Tavern and Clyde’s. More casual spots include Booeymonger and Five Guys. After dark, there’s the classic M Street jazz and supper club, Blues Alley.